You are here: Home / Recipes / Angel Biscuits Recipe – A quest to find the perfect biscuit recipe! 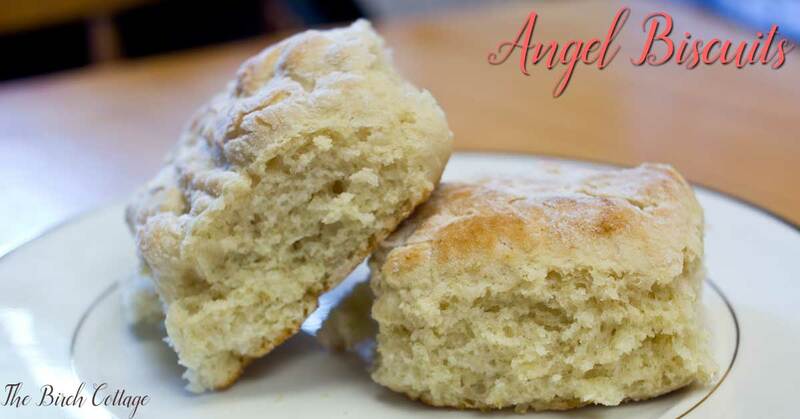 Angel biscuits owe their flaky airiness to three leavening ingredients: yeast, baking powder and baking soda. And, because they’re fool-proof, they’re also known as Bride Biscuits. This past winter, I was on a quest. A baking quest. A quest to find the perfect biscuit recipe. 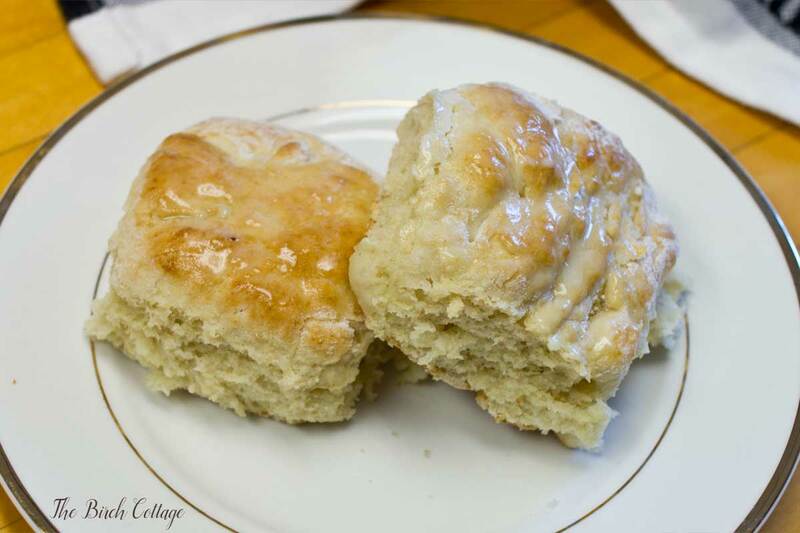 You know the kind of biscuit that’s light and flaky and just melts in your mouth. 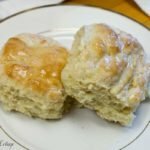 The best biscuit recipe where just one bite causes your mind to race back in time to when you were a child and would have homemade, full of buttery goodness, melt-in-your-mouth, warm out of the oven biscuits. Those biscuits! I really want to be a good biscuit maker but I find my results aren’t consistent. A lot of times simply because I’m multi-tasking and things in the oven don’t always turn out as planned when I’m multi-tasking. They might, if I would confine my multi-tasking to the kitchen, but I’m often times baking, cooking, cleaning and maybe even doing a little laundry all at the same time. Maybe you can relate? Well, I tried several different biscuit recipes. When I’m experimenting with recipes, I always check to see what the food science expert, Alton Brown, (http://altonbrown.com/southern-biscuits-recipe/) has to say about a recipe. Understanding the science behind the ingredients really helps me to hone in on recipes that I think might be a good fit. And then I just start searching with Google to see what’s popular in the search rankings. However, that’s not how I found this Angel Biscuit Recipe. Last summer (2015) while vacationing in French River, Ontario, we took a little trip to the French River Public Library (http://www.olsn.ca/frenchriverpl/) where they had magazines and books for sale. I bought a few magazines and a couple of books. One of the magazines I purchased was Ricardo (https://www.ricardocuisine.com). I’ve actually tried a few recipes from this magazine and they were amazing. Another magazine I purchased was Canadian Living (http://www.canadianliving.com/). I wish I could say for certain where I found the recipe, but I’m not 100% sure which of these magazines I found the recipe in as I wrote down the recipe. All I can say is that I’m “pretty sure” the Angel Biscuit recipe came from one of these two Canadian magazines. Really sorry. What I can tell you about these biscuits is that they are light, yeasty, fluffy and very good! They will not last long. They do require some preparation as you make the dough the night before (you can actually keep it in the fridge for up to one week) and then you have to allow at least 30 minutes for the biscuits to rise before you can bake them. Another name I found for Angel Biscuits was Bride’s Biscuits. Angel Biscuits owe their flaky airiness to three leavening ingredients: yeast, baking powder, and baking soda. 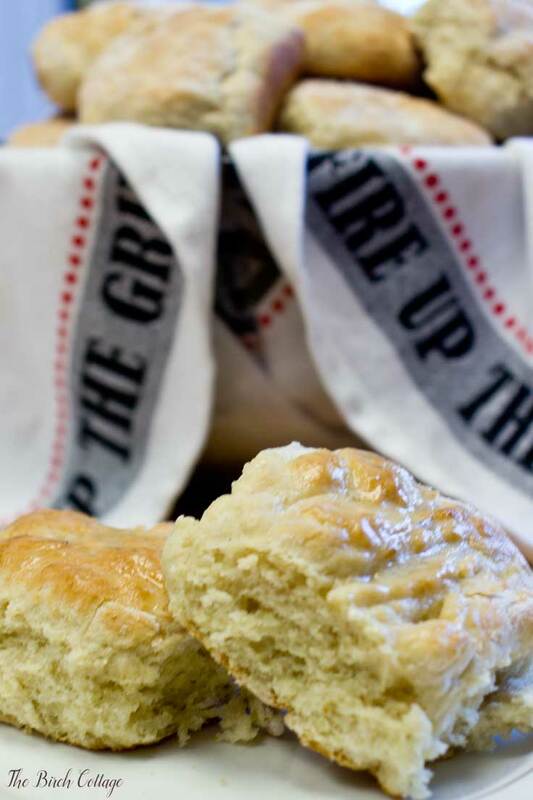 These leavening ingredients make these biscuits “foolproof.” So foolproof, in fact, that even a bride or inexperienced biscuit baker can make them! 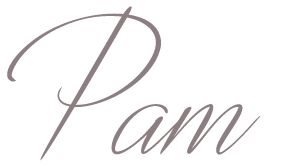 Provided below are links to tools used in the preparation of this recipe. So light and airy, these biscuits are fool-proof! In a liquid measuring cup, combine yeast, water, and 1 tablespoon sugar. Set aside until mixture becomes creamy and foamy, about 5 minutes. Meanwhile, in a large bowl, whisk together flour, remaining sugar, baking powder, baking soda, and salt. Using a pastry cutter or two knives, cut shortening into dry ingredients until mixture resembles coarse meal. Add yeast mixture and buttermilk and stir until dough just comes together. Turn dough out onto a lightly floured work surface and knead 5 or 6 times; dough should be soft and moist. Return dough to bowl, cover bowl with plastic wrap, and refrigerate overnight or up to 1 week. Arrange biscuits, with sides touching, on an ungreased baking sheet. Brush with melted butter and set aside to rise in a warm place for about 30 minutes. Meanwhile, preheat oven to 425 degrees F. Bake biscuits until golden brown, 10 to 12 minutes. Serve warm. My family loved the airiness of these Angel Biscuits. 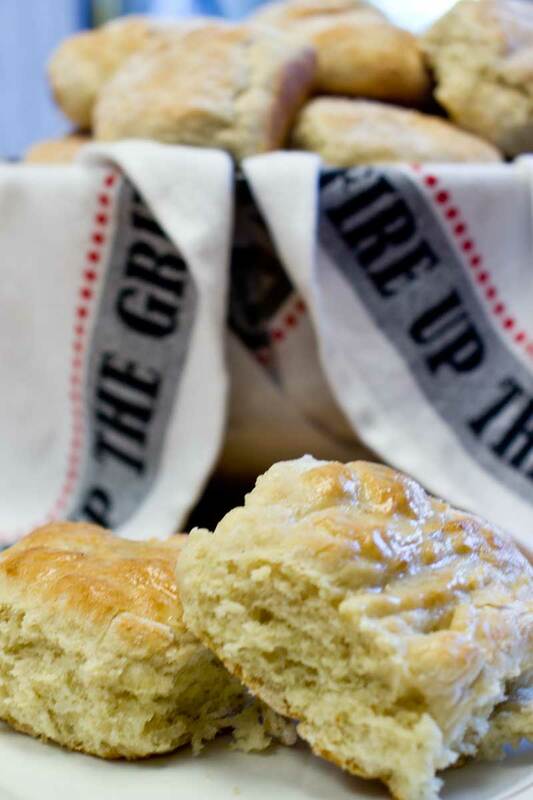 They certainly aren’t your traditional southern biscuit. The addition of the yeast in the Angel biscuits really makes for a much lighter and almost dinner roll type biscuit. Nonetheless, I highly recommend these Angel biscuits. Downside is they take a little time to prepare. Upside is you can prepare them up to one week ahead of time. Another downside? They won’t last long. Upside? They are absolutely heavenly! 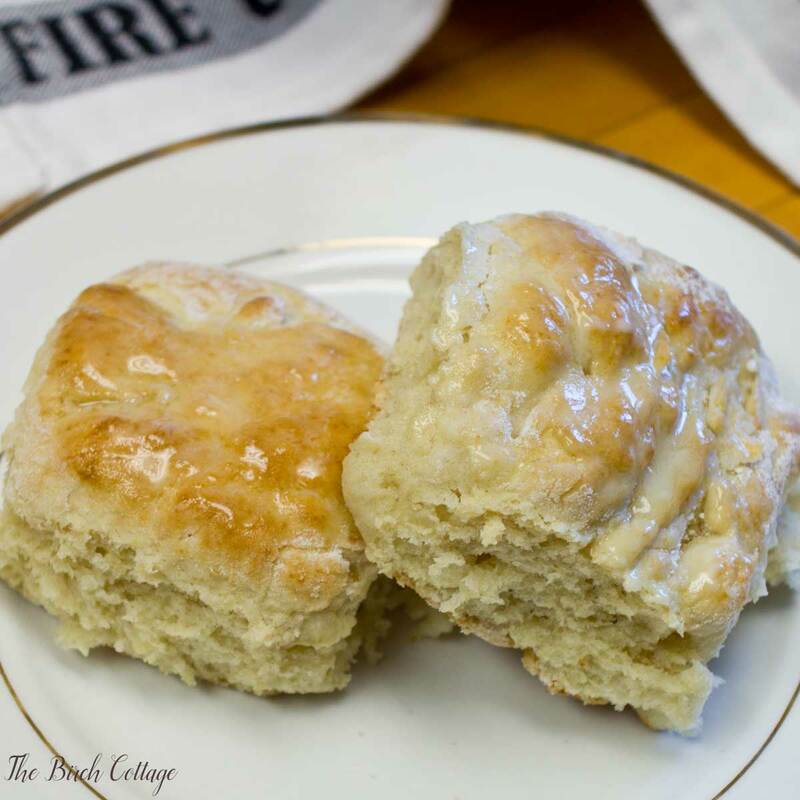 So, do you have a favorite biscuit recipe? 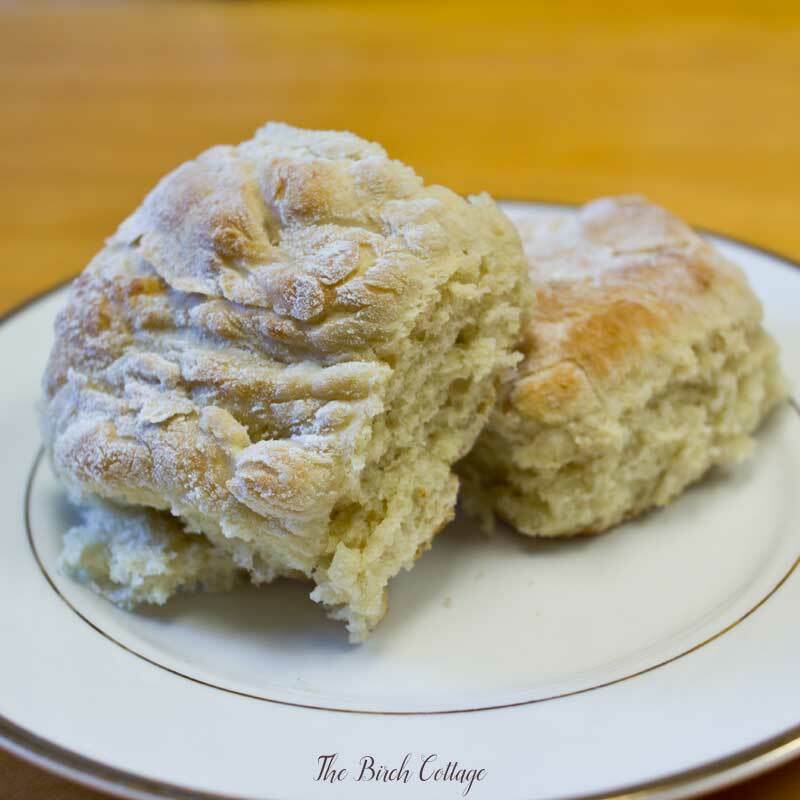 Do you have any hints, tips or tricks to making perfect biscuits? If so, I’d love to hear about it and I’m sure my readers would love to hear about it as well. I don’t know why, but there’s just something that calls us moms to be good biscuit makers – even when we’re not.